**4/18/16 Update - The URL to filter hints has changed - see updated link below in blue! 7667 would be your record database identification number. This can also be a good way to clear out the hints that fill up your "All Hints" list that you aren't as interested in. Thanks for the feedback, Sarah! Hope it helps! This is not sorting 'hints' by record type, but searching from a tree through a particular database. It is not possible to sort existing 'hints' by record type. This search method certainly is useful. Hi Geolover - This is true - however, it is possible to use this method if you are only interested in, for example, searching for census records. Using the record identification number, you can filter out all record hints other than the specific record you are looking for. Does that make sense? Thanks for the feedback - I am curious to know if anyone else is using this functionality. Actually - I see exactly what you are saying. I am going to re-title. Thanks again! One minor correction. The "record number" you refer to is not actually a record number (those are specific to a particular record ie. the 1880 census in Bibb County, Alabama for Sally Jones). They are correctly called a "database id" - hence the "hdbid" in the URL. Record types are things like census, birth, etc. A database is a specific collection of records like the 1880 Census or the Pennsylvania Town and Church Records. Make sense? Thanks, Crista! That makes complete sense and I did not know what hdbid stood for - you learn something new every day :) I'm going to update my post now! Between you, Russ Worthington and History Chick ( the writer of Genealogy Musings) is why I keep my Ancestry account and my FTM 2012 on my computer. Thanks for sharing these tips. This is incredibly helpful. I cannot believe ancestry.com does not have this type of filter available on their website. Thank you! 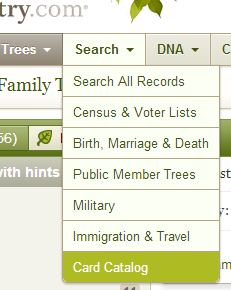 So if say you wanted to look at ALL hints that were for Census & Voter Records, no matter the year, would you be able to enter the "category" number that pops up? Example: when you go to the Search dropdown box, &hover over Census & Voter Records, the end of the address is "cat=35". Would it be accurate to replace the "hdbid=" with "cat="? MusicWheelie - Great question! I just tried and didn't have any luck but it may be a matter of placing it elsewhere. I'll keep trying! Same here. This was crazy useful. Anyone know what's up? Looks like there was a change made that disabled this hack. I've pinged the product manager and she is checking with the developers to see what can be done to get this functionality back. I'll keep you posted. Hi, any news on getting this to work again? Would love to filter out unwanted hints from the near 10000 that have accumulated on me. Or not, this no longer works either. The hint filter works again!! Replace “MyTree” with your tree number. Thank you for this! I had Alabama's database # & couldn't find the others in the card catalog! That's terrific! This is exactly what I was looking for. Thanks! Is this still working? I keep getting redirected to your tree, Lauren. What am I doing wrong? Hi Amy! It's still working - you just need to replace the "tree number" with your tree - the link provided has my tree number. 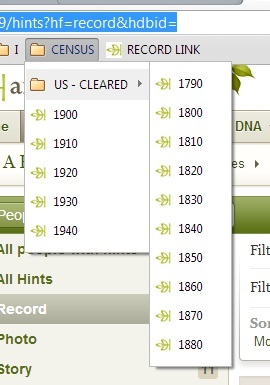 Anyone know how well this still works with the new Ancestry layout? For some reason, my links have not been working since yesterday. I'm hoping this gets resolved! Hello, it seems they changed the "wording" at the very beginning of the URL. 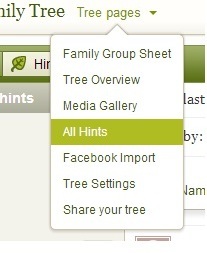 The old one as of a day or two ago started: http://trees.ancestry.com/tree/ and now it starts: http://hints.ancestry.com/tree/ so just replace the word trees with the word hints near the beginning and all should be well. Update your bookmarks. Good luck! J Anonymous - You are my hero! Thank you! @musicwheelie - I completely agree. This is a new issue - it never used to happen. What I do is right click on "review hint" and then open in a new tab. Then I refresh the list of hints after I've added it. Definitely a pain, but better than the alternative! Thanks! I'll have to try that and see how it works! Can this be used to stop the reappearance of hints after they have been "ignored?" Another Ancestry user downloaded hundreds of my photos and documents and then, I believe, uploaded them to her Ancestry tree, thereby changing the attribution from my username to hers. I continue to receive these photos/documents as hints even after I have chosen Ignore. They continue to periodically clog my hints. Thank you! It was working about 2 months ago. I used this method frequently. Anyone have a new URL?